If you think that creating a website is a piece of cake, you couldn’t be more wrong. Launching a website is not only about a nice design or great features, but also about being detail-oriented and focused on usability. Without taking care of these factors, even the most beautiful website may be useless and therefore won’t help you achieve your business goals. That’s why it is so important to remember about things to do before launching. Here at Creogram, we decided to make things easier for you if you’re just about to launch your website. 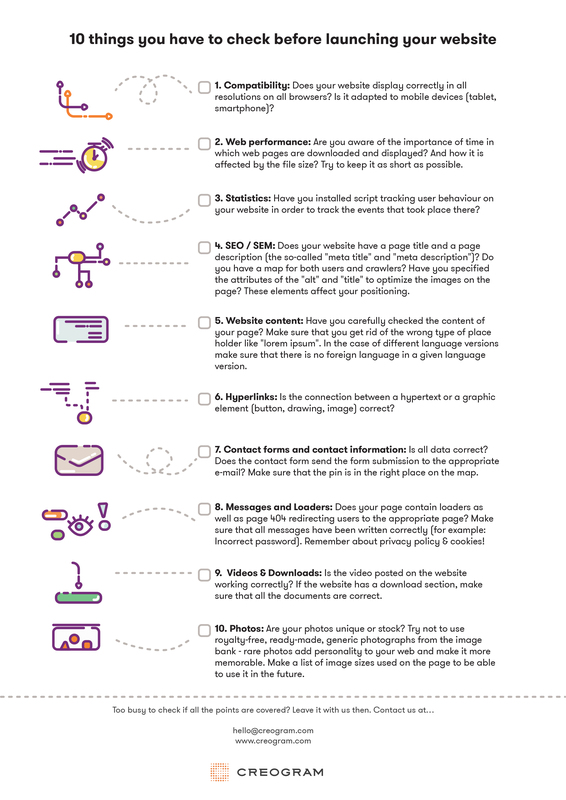 We prepared a special checklist that you can follow to make sure you’ve done some small but essential things on your site. By simply printing the list and crossing them out you’ll be sure that you’ve done your best. If you like what we created, or know someone that this list would be useful for – share our material so it could reach, and help, more people!